Early Bloomer. Five deep lavender or white petals, yellow band, nodding flowers bloom early in shady place. Notes: Primrose family. 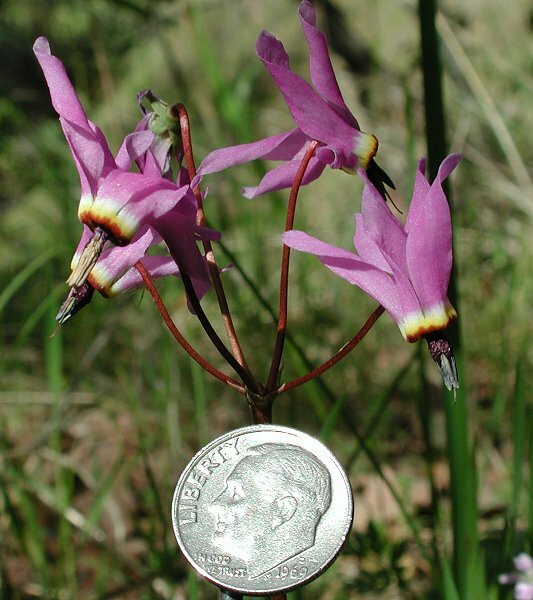 The USDA lists 15 Species and 38 accepted taxa overall within the Dodecatheon (shooting star) genus. This particular species is also called Mosquito Bills. The distinctive looking flower is a very early bloomer, usually found on the left slopes as you approach the French Corral Creek Bridge. The stems and leaves are reported to be edible after boiling or roasting. The name is from the Greek dodeka (twelve) and theos (a god). According to historian Pliny, the flowers reminded him of a meeting of the 12 major Greek gods.